The new year is a wonderful time to give your house that little something extra whether that’s some new curtains, blinds, carpet or a whole new look altogether. For some being on-trend and keeping up-to-date with all the latest styles and colours is very important. In this blog, we will be discussing predicted up and coming interior design trends for 2019 you should be keeping an eye out for – from colours and patterns to the style of the room. Floral fabrics have been in and out of fashion for many years now, however, we believe they’re back for good. Floral accents are all the rage right now, with the most popular being floral curtains. Add that little something extra with some bold pattern floral curtains, perfect for those more simple rooms with minimal colours and patterns. A big trend which has already started to infiltrate the UK is pops of bright colours. Layers of white tones and textures fill the room, creating a fresh and clean atmosphere. Different shades of white are layered in a room to give it more depth, then different colours are placed all over the place to make that room pop even more. These pops of colour are used to peel back the white and embrace these bold, fresh hues of colour. One great way you can make any room pop is with bold, bright curtains. The most popular type of curtains are pencil curtains, these are a great addition to any room – complementary to both traditional and modern styles. Using your curtains to add that pop of colour is a simple yet effective way of giving your room the boost it needs. Throw cushions are another great way of adding that pop of colour. If you have a smaller room bright colours are a great way to open the room to make it seem larger than it is. Adding throw cushions in different tones and shades is a great way to make the room pop even more. A mixture of metals throughout a room is a great way to give your room definition and a timeless feel. When deciding which metals to mix remember to balance the metals through colour, style, shape and look. It’s all about keeping things in moderation, not too much of one or the other. Feature walls have been a popular trend for a long time now, however, instead of a bold wallpaper many homes are opting for a simple, bold colour. 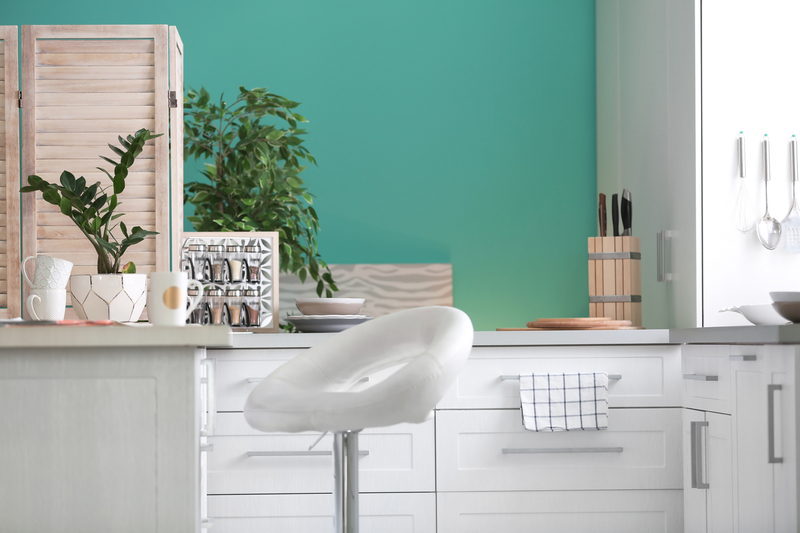 For a dramatic pop of colour, a feature wall is a way to go. Easily dressed up or down, no matter how bold it can be tailored to your style and taste. Popular shades we are spotting all over the UK are indigo and deep greens, filling many rooms with that stylish, on-trend look. Don’t be scared to go bold. If you are a little worried about how bold the colour may be, you can always dress down the colour with a few simple tricks. Light curtains or blinds are a great way to tone down the chosen colour, whilst giving you that oh-so-needed privacy, they also create that perfect atmosphere. Simple yet elegant furniture is another way to tone down bold colours, to create that perfect balance between stylish and out there. Patterned fabrics have hit the market once again, this time with a boho vintage, yet modern twist. Furniture and patterns with softer lines are predicted to storm the market in 2019, giving a bright but elegant feel. Fill your home with unusual, intriguing objects and patterns, to attract all eyes. Certain suppliers such as Lakeland Furniture specialise in offering furniture that works perfectly for that Boho vibes. Thank you for reading our blog, did you find it helpful? If you have any questions or queries about curtain trends for 2019, feel free to contact us and one of our skilled team members will be happy to advise.